Shortly after Lyndon Baines Johnson died in January 1973, some of his friends began to consider creating a national memorial to the 36th president of the United States in Washington, DC. They decided that a grove of trees, a “living memorial,” would be a fitting representation of a man who valued nature in his personal life and supported environmental protection in his presidency. Lady Bird Johnson selected Columbia Island, lying between the George Washington Memorial Parkway and the Boundary Channel, as the site. The LBJ Grove Memorial Committee raised more than $2 million in donations from people all over the United States. Noted local landscape architect Meade Palmer worked closely with Mrs. Johnson to plan the grove, which opened on April 6, 1976. The memorial grove has two sections. The commemorative area, surrounded by a grove of pine trees, focuses on the life, goals, and accomplishments of Lyndon B. Johnson. The second section consists of a broad grassy meadow encircled by a gravel path for strolling and framed by trees. Intended to provide physical and spiritual rejuvenation, this part of the grove also reflects the solace Johnson found in nature and the outdoors. The grassy meadow, especially set aside to provide a peaceful setting for people to sit, walk, and relax, is in keeping with Johnson's legacy of trying to ensure that all Americans could enjoy what he valued. 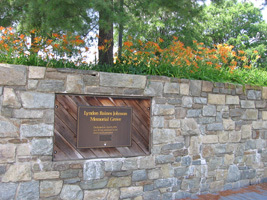 In the formal commemorative area, a broad flagstone walkway gently spirals through a grove of white pines to a 19-foot tall, Sunset Red granite monolith in the center of a flagstone plaza. Quarried in Johnson’s native Texas, the stone arrived on the site in 1974. The grove, consisting of 900 white pine trees selected for their form and evergreen color, surrounds the plaza on three sides. The third side is open and looks out across the Potomac River toward Washington, DC. The mature trees create a dramatic feeling of enclosure for visitors walking on the path to the plaza. Azaleas, rhododendron, flowering shrubs, wildflowers, and spring bulbs cover the ground beneath the trees. The form and placement of planting beds and the low, flagstone wall that parallels the path echo the spiral design of the walkway. Mrs. Johnson selected the four quotations inscribed at the base of the granite monolith. They embody the President’s thoughts on the environment, education, civil rights, and the presidency. Four simple benches at the edge of the plaza provide a place to contemplate the view of the Lincoln and Thomas Jefferson Memorials, the Washington Monument, and the Capitol across the Potomac. The Johnsons often stopped here on many occasions as they drove back to Washington along the George Washington Memorial Parkway. The second area of the memorial grove focuses inward on the sweep of grass that constitutes the meadow. More informal than the plaza area, it provides a variety of passive recreational activities. Benches along the gravel walkway that winds around the meadow give visitors a chance to sit and relax, and there are picnic tables under the trees that frame the meadow. The designer of the memorial thought that an expanse of grass framed by trees was one of the most pleasing of all landscape views. This relatively small space plays the same role as the grand public parks of the 19th century. Like them, it offers visitors-- many of whom are urban dwellers-- rejuvenation, passive recreation, and a chance to enjoy the outdoors. Ideas about memorializing presidents changed dramatically during the course of the 20th century. Early memorials tended to be imposing architectural monuments, using the language of Classical architecture to honor the president and his accomplishments. In Washington, DC the Lincoln and Thomas Jefferson Memorials are superb examples of this type. In the late 20th century, interest grew in creating “living memorials” that use landscapes, rather than buildings, to embody the president’s ideals and serve other desirable public purposes. Theodore Roosevelt Island and the Frankin D. Roosevelt Memorial are other excellent examples of living memorials. Using a grove of trees as a living memorial to Johnson was particularly appropriate in view of his record in preserving the nation’s natural heritage. The Johnson Administration oversaw the addition of 3.6 million acres of land to the National Park System, passed the Wilderness Act, and created the Land and Water Conservation Fund. It initiated the first legislation regulating water pollution, in 1965 and 1966, and air pollution, in 1963 and 1967. The Water Resources Planning Act, the National Historic Preservation Act, the establishment of the first National Water Commission, the Endangered Species Act, and the Wild and Scenic Rivers Act were all a part of the surge of legislation directed at protecting the environment and natural heritage that Johnson embraced. The Lyndon Baines Johnson Memorial Grove was designed by Meade Palmer in collaboration with the architectural and engineering firm of Mills and Petticord and sculptor Harold Vogel. It is an excellent example of contemporary landscape architecture, allowing the site to dictate the form of the design. The designers planned the grove for a variety of users. For visitors, it provides a memorial to the 36th president of the United States and a pleasant outdoor setting. For motorists on the George Washington Memorial Parkway, it is a lovely view. For passengers in planes approaching Reagan National Airport, the grove becomes an abstract expression of landscape art. The Lyndon Baines Johnson Memorial Grove on the Potomac National Memorial, a unit of the National Park System, is located near the Pentagon and Arlington Memorial Cemetery. The George Washington Memorial Parkway provides direct access to the LBJ Grove parking areas. Click here for the National Register of Historic Places file: text and photos. 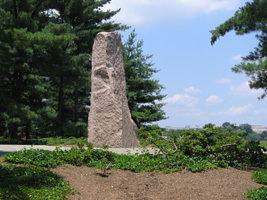 The memorial is on Columbia Island, west of the 14th Street Bridge and south of the George Washington Memorial Parkway. The 17-acre park is bounded by the George Washington Memorial Parkway on the northeast, the Boundary Channel on the southwest, and Columbia Island Marina on the southeast. For more information visit the National Park Service Lyndon Baines Johnson Memorial Grove on the Potomac National Memorial website or call 703-289-2500. The Memorial Grove is open year round during daylight hours. The park closes at dusk. Restrooms are at the adjacent Columbia Island Marina and are open from 7:00am until 10:00pm. Admittance is free to the public. The closest Metro station is Arlington Cemetery. Visitors may also want to explore more of Ladybird Johnson Park, of which the memorial grove is a part. This park was created to honor Lady Bird Johnson’s contributions to beautifying Washington, DC and the country as a whole.